Foresight Program and Professor Minoru Ueda for selecting me to ‘‘The Third A3 Roundtable Meeting on Asia Chemical Probe Research Hub’’ which was held at Jeju Island, Korea, from Oct. 31 to Nov. 3, 2018. This meeting had a lot of wonderful presentations about organic chemistry and chemical biology. 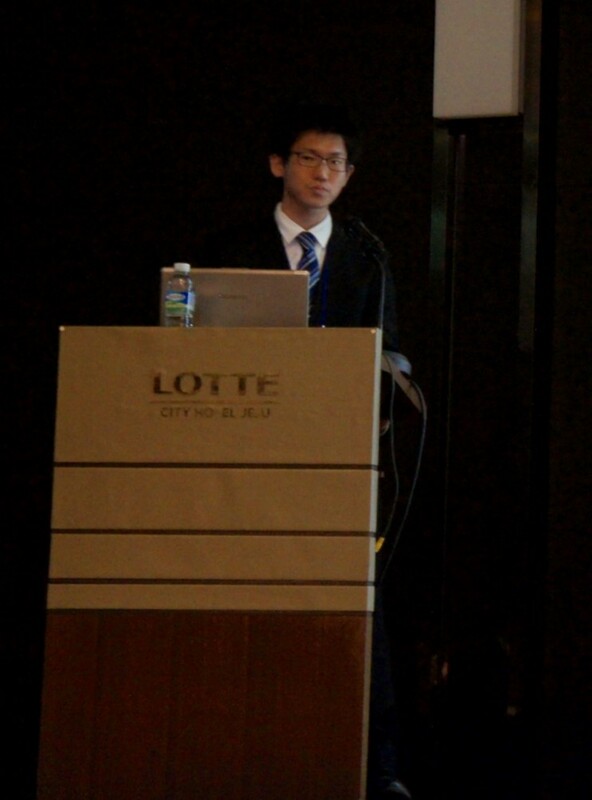 It was my second chance to present my research abroad (the first one was at the 8th Junior International Conference on Cutting-Edge Organic Chemistry in Asia (Junior ICCEOCA-8), which was held in Singapore the day before the A3 meeting). Unlike domestic symposium, I was anxious because I had to discuss my research subjects and to answer questions in English, but I got over. Moreover, by discussing with many professors, I could deepen my understanding of my research. Many lectures by A3 members were very meaningful in considering my own research. By hearing many chemical biology talks, I was able to think about how to use my research (development of strategies for alkynylation of bioactive molecules) in that area and how my research could be a more useful to develop biological studies. Also, I could hear and touch on the latest researches on organic synthesis which is my special field. Also, I was able to enjoy sightseeing in Jeju Island. susuki grass fields and the caldera of Sangumburi were very beautiful and I felt part of the beautiful nature of Jeju Island. At the ethnic museum I visited before returning to Japan, I could touch on the geography and history of Jeju Island. This visit to Korea was a good opportunity to learn not only chemistry but also various things. Finally, I would like to thank everyone again.